The rapid development of sensor technology provides cement producers with a toolbox of solutions that optimise performance potential and strengthen market presence. Non-contact volume flow measurement of conveyed materials can help to optimise the material handling process from quarry to final product. Bulkscan® flow measurement technology, introduced by SICK Automation several years ago, had its portfolio broadened in latter 2018 with the introduction of its Bulkscan low cost LMS111. Both versions provide non-contact maintenance-free measurement of volume flow more accurately than mechanical belt scales. They also minimise errors in mass and volume flow rate calculations. The cement industry can learn from Industry 4.0-leading sectors, and adopt best practices and technology where applicable. One of the key components of Industry 4.0 is the ability to take data from process sensors to a centre that can evaluate this information and recommend closed-loop process changes. Data collected from process sensors can be stored and evaluated over time to spot patterns and determine trends. Attaining this level of ‘Big Data’ and cloud accessibility in the ‘Internet of Things’ (IoT) increases the potential for process improvements, as well as opening up opportunities to quickly assess and respond to consumer trends and environmental correlations. Knowing how much raw material is in the yard is a challenge. It is essential that conveyors provide a nonstop flow of raw materials, additives, fuel, clinker and cement upstream and downstream of the pyroprocess. Mechanical scales measure mass and the volume of material transported is calculated using an average material density. This process is hindered when material density changes and when a conveyor belt is not properly maintained. Material density is used to convert mass from the weigh scales into volume and vice versa. “When the density is incorrect, the volume and mass calculations are also incorrect,” Bartknecht and Savino concur. Bulkscan® flow measurement technology enables the yard manager to directly measure the contour, volume, height and material distribution through the use of LiDAR (light detection and ranging)-based technology. The sensors can be mounted over conveyor belts, onto cranes and reclaimers. 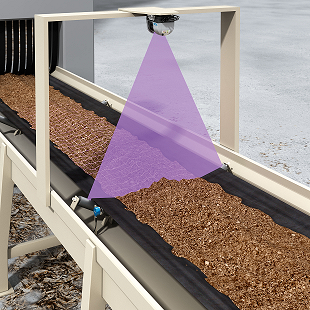 Inside the Bulkscan® sensor, high-pulse laser beams create a profile of the material on the conveyor which, in combination with belt speed, represents volume flow and calculated mass flow. This measurement principle is based on a laser beam that is deflected internally across a rotating mirror. The sequential order of the laser pulses is synchronised with the rotation frequency of the motor and the desired angular resolution. Generally, the motor rotation speed is determined by the maximum emitted pulse frequency of the laser source and the desired angular resolution. The laser beams scan the surface area of the material on the conveyor and send this information to the measurement device, which compares the data with an empty reference conveyor belt. Bulkscan® allows plant operators to directly measure volume flow on conveyor belts, bucket elevators or drag chain conveyors outdoors in harsh conditions as well as inside the cement plant. The scanner can be mounted above the conveyor, measuring volume flow without any material contact, making it virtually maintenance free. The collected data can either inform manual processes, or act as an input to fully-automated systems to drive changes in material flow and composition. When large objects are detected, the plant operator is alerted and an automated stop process is triggered. Bulkscan also helps plant operators to optimise conveyor operation and reduce unplanned downtime. The same laser beams used to measure the bulk flow rate also provide information about the exact height and distribution of the bulk material on the conveyor. In addition, the centre of gravity of the load and the distance between the bulk material and the conveyor edge is measured and provided to a closed-loop system to adjust material distribution on the belt. This process automation helps increase belt life and decrease one-sided roller wear and downtime. Bulkscan can also be used in conjunction with a weigh scale. The actual bulk density can be determined in real time as the device measures the volume while the weigh scale measures mass. When these values are known, density can be calculated.